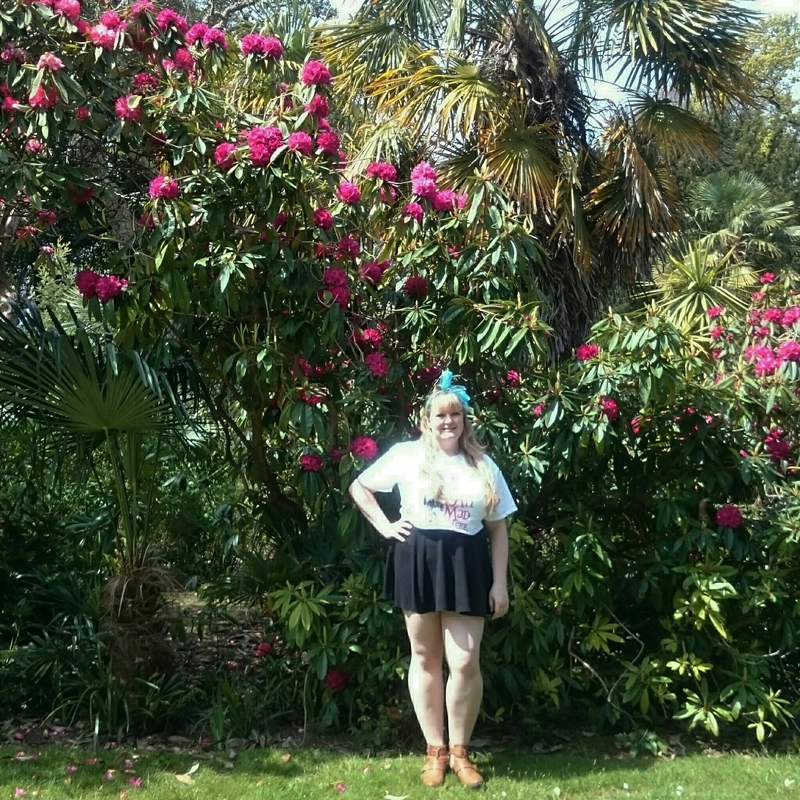 What to wear to a blogger event? I distinctly remember attending my firstt blogger event last year and feeling nervous about a hundred different things: would the bloggers be nice, would I be treated like an outsider, would I be able to keep up with thier conversations, what the heck were you even meant to wear to a blogging event? New situations make you uncertainty, and uncertainty can make you feel nervous. Ultimately I dressed a little more “up” than I would normally, I put a few curls in my hair and popped a pair not heeled boots. It turns out that it was pointless to worry though everyone looked incredibly stylish they did so in a jeans and scrappy vest, or a sleeveless knit. I slipped my boots off and spent the afternoon talking to a bunch of the nicest people (post here). My first event, I wanted to dress a bit trendy with the 70’s style skirt, but not go against the relaxed nature of the event. This was around Christmas-time I wore a belted Poncho I had made from a picnic blanket,curled my hair and popped a red peplem top and jeans on. Warm, comfortable and perfect for browsing through some shops after. I kept a nod to the trends in a bardot setyle off the shoulder top, which I paired with a very full midi skirt. As this was a makeup event I kept my look natural for work with a pretty braid. If you can’t dress up for brunch, when can you? This was my first time wearing this gorgeous Primark dress and will not be the last time. I paired thus with the same boots i seem to wear to every event! The last blogger event was Alice Themed so I opted for a light blue headscarf in Alice style colours, a little Skirt and an oversized T Shirt with a scene for the book. Inkeeping with the theme and my style without bordering on fancy dress. Ultimately wear whatever the heck you want. Other bloggers aren’t any different to your normal circle of friends, wear something that makes you happy. Generally when it comes to a blogger event I’ll wear something new, whether that’s a dress or lipstick. Working in an office I relish an opportunity to dress-up. I have a tendency to forget about a book if the first few chapters don’t grab me, this is a terrible habit as so often the books I give up turn out to be ones I get addicted to. Horns is a perfect example of this, I started this novel last February and abandoned it until a month or so ago. I saw this trailer to this a couple years ago and was hooked, after a bit of research I found the film was based on a book by Joe Hill, Stephen King’s son! As soon a single could get to Waterstones I bought myself a copy of the novel. And it isn’t a film cover, one of my pet peeves when it comes to books is being stuck with a film cover. Often a cover tells such a story in itself. After a very public drunken fight with his girlfriend, Ig walks away from her to sleep his hangover off in his car. The next morning she turns up raped and murdered, and the town as a collective can only think of a be person who could have committed the crime. A year after Merrins murder Ig wakes up feeling guilty and hungover unable to remember the night before, with a splitting headache that turns out to be a pair of horns growing from his head. Horns which make people tell the truth, and can influence people’s actions. This is a book I was so sad to finish. The story is original, but with nods to the detailed storymanship that made me fall in love with his father’s writing. I have a tendency to second guess situations and endings, and a prolific horror and crime fan I’m pretty good at it. Not with this story, at multiple points I thought the story had ended (even with hundreds of pages left), and each time I was on tenterhooks. The story is incredibly multilayered, it is not only concerned with Ig’s quest for the truth, but also human motivations and the stories behind thier choices. You see the underbelly of Ig’s relationships, and hear the thoughts that people would not share under any circumstance other than these Horns. Horns is one of my favourite books of this year, and one I feel I’ll love for an age.This story has stayed with me, and I can’t bring myself to watch the film just yet incase I hate the interpretation. I am about to lend the book to a colleague though, abd hopefully I’ll have another person I can wax lyrical with. Have you read Horns, what did you think? What would you recommend reading next? I am the biggest creature of habit. If I find a routine that works I will not change it for years. That being said, a few new things have been added, some little things I’ve picked up and a few things I’ve found whilst shopping my stash. So this is what I put on my face. So as always I start with my Estée Lauder BB cream, which I apply with fingers. But, recently what I’ve been doing is after I’ve applied with fingers I go over with the big kabuki brush from Tropic. This helps make sure everything is blended and just takes that top layer off to make it all look more natural. Then after concealing I set with any drug store matte pressed powder. For concealing I always have a two step process. 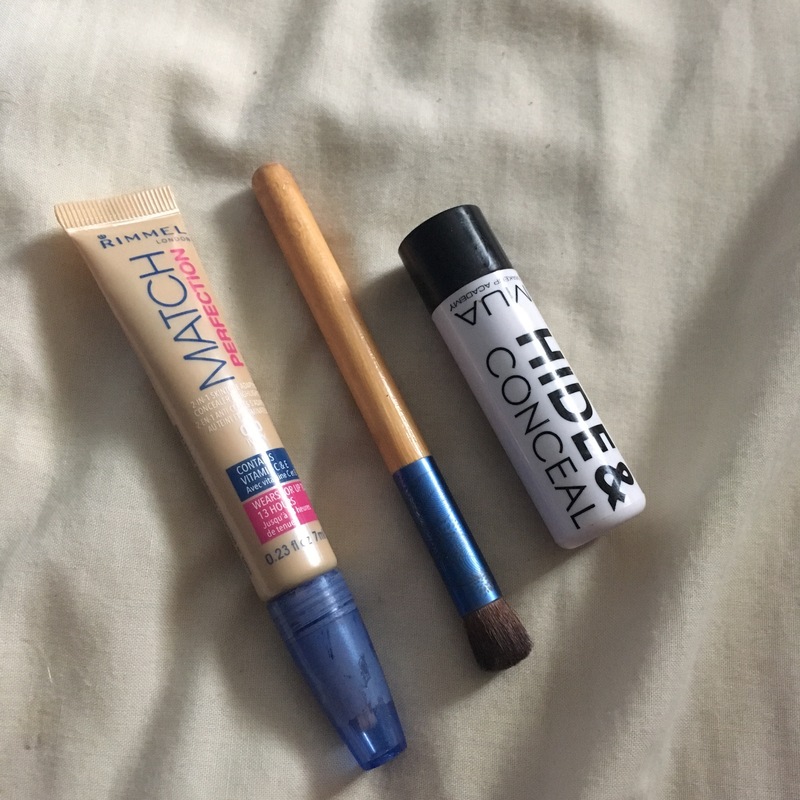 First, I use the Rimmel concealer to deal with under my eyes and on blemishes or redness, where it is stippled using the blue Eco Tools brush. Then after powder is applied if any problem areas are still poking through I use a little of the stick concealer, this one is from MUA in Superdrug, to cover them up. Next is my cheeks, I’ve rediscovered my Body Shop Honey Bronzer and I apply that using the Real Techniques brush is a vague contour shape that just adds warmth to the skin. 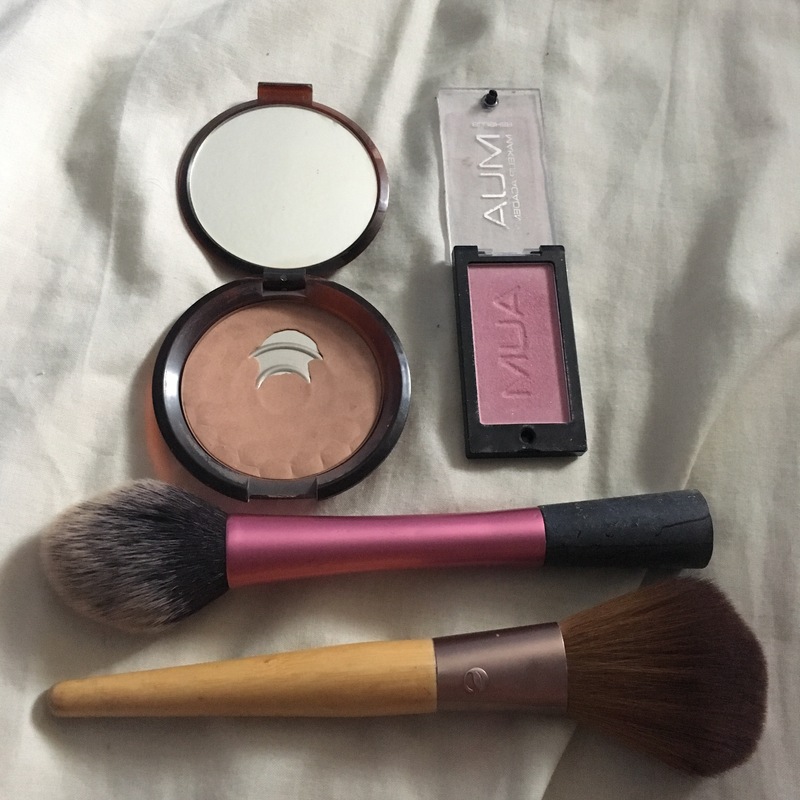 Then I use the Eco Tools brush with the MUA blush on the apples of my cheeks. I find this adds a nice fresh flush to the skin, making it look a tad more natural. 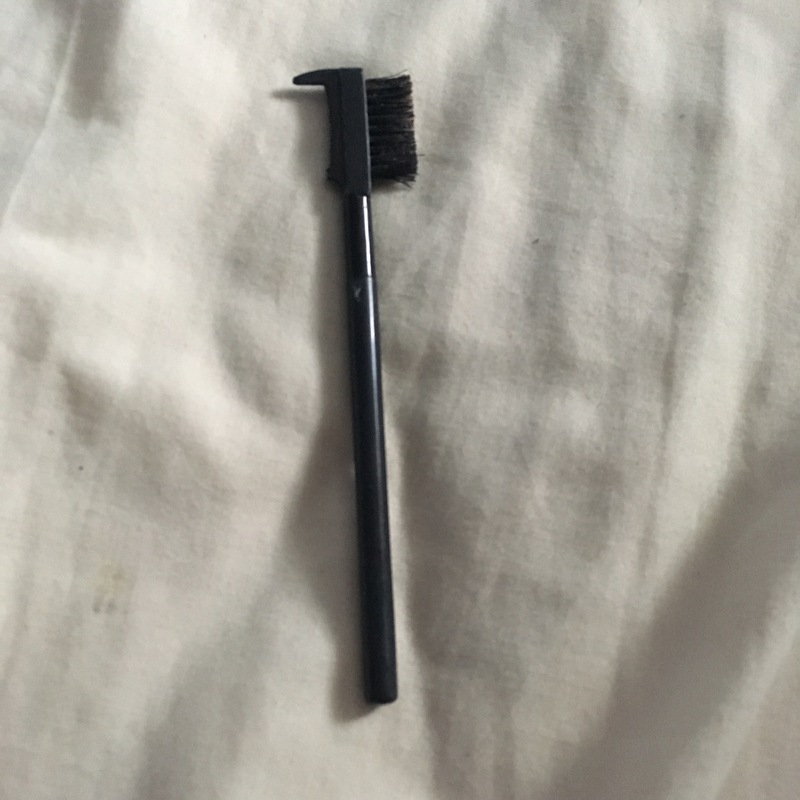 Last thing to do is, brush through my eyebrows with this brush that’s as old as time. I don’t do anything with my eyebrows day to day because it adds more time and I have quite a strong brow naturally. So, that’s it. 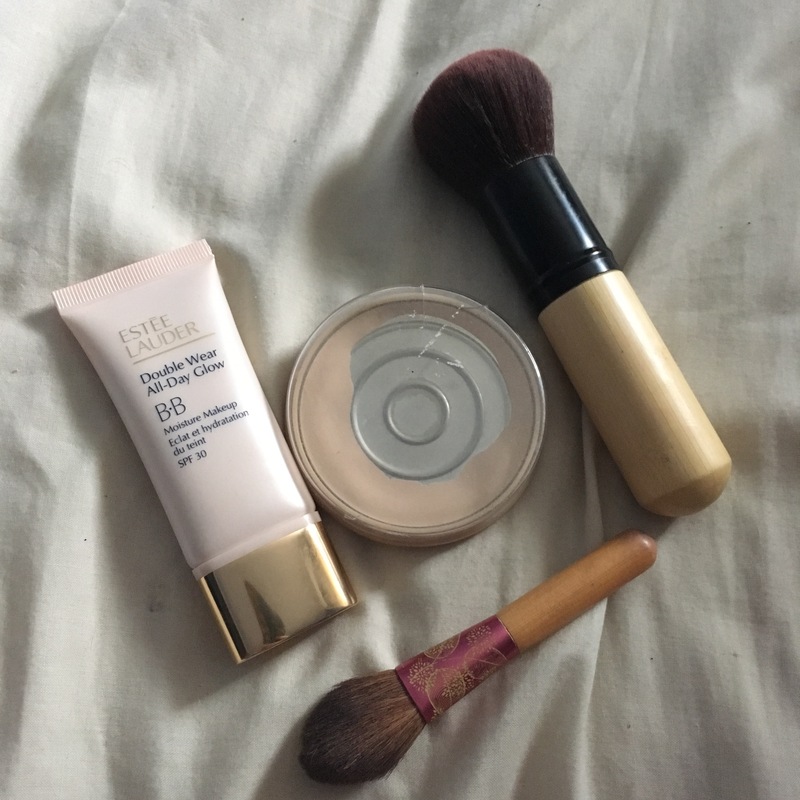 Those are the products I use on my face everyday. What products do you swear by? I eat a lot of salads, it’s a combination of wanting to eat healthily, and wanted to eat something that’ll fill me up. Everytime I bring this salad out people comment on how colourful it is, or how good it looks. It’s really simple, easy to mix up and make a double portion so it’ll last two days. This is a Feta and Halouimi salad, solely because those are the things I’m obsessed with presently. Your could easily replace these cheeses with Mozzarella, Chicken and Bacon, or remove it all together for a tasty vegan salad. Talk about the perfect Avacado! A while ago I watched a Mary Berry Programme where she talked about making a salad the night before that doesn’t result in soggy limp leaves through this layering method, I’ve been using it regularly ever since and always have a fresh and crunchy salad. I clingfilm the lid and pop the lunch box in a sandwich bag, I find that the beetroot came leak and I have already stained a purse through this discovery. When it comes to lunch time, I separate the cheese and leaves into the lid, place half the chopped veg onto a plate with half the leaves and cheese, before placing the rest of the salad in the fridge for the next day. I always have dressing on my salad, last week it was a piri sauce, the week before balsamic vinegar and this week’s it’s a honey mustard dressing. I tend to use small sauce pots to bring in what I need. And that is my easy, filing everyday salad. It seems almost too easy write a post on but I’m asked about this everytime I eat it. It’s basically everything that was in the fridge the night before, I normally grate some carrot in and this works really well with pomegranate seeds. It’s an easy salad to make to whatever budget you have, the other week I ran out of Feta so grated some plain Cheddar in. What do you tend to bring to work for your lunch? If you use this recipe please let me know! (if you love Halouimi but don’t often prepare it at home, it’s the easiest thing to prepare and you can freeze it! 1. Cut up your Halouimi into 5mm thick slices and place in a plain on medium heat in a non stick pan. No need to add oil, these dry fry. 2. After a few minutes these will release a liquid, once it evaporates your Halouimi is probably ready to be flipped, check the other side. If it has golden brown patches flip. 3. Fry on the other side for a couple minutes, check for that golden brown colour. 4. Once both sides have golden brown patches your Halouimi is done, chop it up for salad, add to a burger, or just eat your Halouimi slices! The bits I cooked here were from frozen, and after defrosting in the microwave they tasted the same as the previously unfrozen batch of Halouimi. I always find mothers day gifts easier to plan than father’s day gifts. My mother is sentimental, loves bath things, flowers and I can pin her music tastes down to a tee. My dad is a non sentimental ex DJ with a fondness for some very niche tech. Hopefully you’ll find some inspiration here if you, yourself are stuck for ideas with a few different budgets. My dad has a sweet tooth so a cake always works well. This is a sponge cake with cream and jam. Whipped yogurt and lemon curd also make a lovely substitute. BBC good food have a lovely recipe. Local Fudge is a brilliant idea, my Dad always opts for rum and raisin ice cream so that’s an easy transfer when selecting a flavour. My dad loves a DVD, and I know his favourite genres. A trip to CEX and a scouring of the Western/War/Sci Fi/TV section would provide an affordable option, and eclectic selection. One of the best gifts I’ve got my Dad was a current season England shirt. These can be a bit pricey, but for a football, rugby or any sports fan really, it’s a brilliant idea. This was found on Nike. Father’s day is this Sunday (the 19th June), what are you thinking of getting your dad? Hope this was helpful as a jumping off point if nothing else! I love vintage style, you probably won’t find me doing full vintage but there will likely be a vintage nod or element to my look. One of my favourite events of the year is the Vintage Fair at Plymouths Guildhall organised by Miss Ivy Events (I bloody love the Guildhall!) and April’s event was no exception. Sally and I popped along with my sister and we spent a good couple hours falling in love with everything from jewellery and glassware to lamps constructed from teacups and teapots. I tend to skip the clothes at vintage fairs, unless there’s a small rail on a stand I tend to feel overwhelmed. I do however always feel drawn to scarves (something that has been increased by last weeks Sewing Bee. Lingerie out of old silk scarves?!!). At the last fair I attended I approached Bag End Bags explaining that I wanted to try wearying headscarves, but was unsure what I should be looking for. I have long loved the look of headscarves but find that high street scarves never really hit the mark, so it was incredible to impart some knowledge. She took me through a few of the affordably priced scarves in her collection and recommended trying a chiffon scarf, as this was material that most women would have worn in the 50’s and 60’s, I ended iup leaving with the most gorgeous silky yellow polka dot scarf and a green patterned chiffon scarf. Out of the two I reached for the chiffon number more often than not, the material is not only impactful but has an incredible staying power. I have a lot of fine hair and chiffon scarves sit really nicely against my head, with the need for an absolute minimum of Bobby pins. Pair with this my tendency towards headaches anything that minimises pressure on my head is much appreciated! I looked through the fair for appropriate scarves and purchased one with minor flaws from Vintage and Retro Plymouth (a lovely store previously a part of the Pannier Market who were my entry to vintage) and two more from Bag Ends Bags. This is how I tend to wear the scarves, I need ro be careful how I style these as it’s very easily to look like a doll or very childlike with these pieces. I will often offset it by tucking away the tails of the bow with some hair grips, or by double wrapping it so the knot ends under my hairline and I have a sleek alice band style look. There are a few things to bare In mind when buying vintage: firstly, always examine what you’ve picked up in detail. Check hems, where price tags have been placed and areas of wear. If you do find an imperfection ensure that its something you don’t mind being damaged beyond repair in future. For example, the peach scarve I have tied the biggest bow ever had holes in it, but I knew that how I wanted to wear it wouldn’t affect the look too much. And this sort of brings me onto my second tip: don’t be afraid to haggle! I got the damaged scarf from £2 to £1, meaning if the tear gets bigger and renders the scarf unwearable I won’t be so irritated. Sally managed to drop the price of a denim jacket she wanted by a couple pounds just by asking, it might feel awkward but most traders expect people to try to haggle. Finally get to know the stall holders, or in the least make small talk! When I found the navy headscarf I started chatting to the lady on the stall about the other bits I’d bought from her and what I was after, she picked up the beautiful blue polka dot scarf from one of her displays, something I hadn’t even seen, and that made my interpretation of the Alice theme at May’s Blogger Meet so much more me! I love these fairs as alongside brilliant stalls, they have a lovely pop up cafe with fine bone vintage China and delicious cakes, brilliant cat walk shows and create such an amazing atmosphere. I can’t wait for the next one, maybe to start saving my pennies for the next scarf bundle or possibly a vintage necklace? Miss Ivy organises a huge amount of events across the Plymouth area, if you wanted to check out the events calendar it can be found here, including an event on Plymouth’s Piazza this Sunday! So this weekend off the back of Plymouth Blog Meet (I will write a post on it at some point) a handful of us met up for a brunch. I love blogger events, I always get so nervous about meeting these people Im building a friendship with, but the are always amazing. Its like you have this opportunity to make a bunch of new friends who you have so much in common with, who are really friendly and knowledgeable. We popped along to Boston Tea Party in Plymouth where we pulled together a few tables to accommodate the five of us (Lorna, Alice, Ellie, Nicole) somehow every one of us ordered somerthing different. 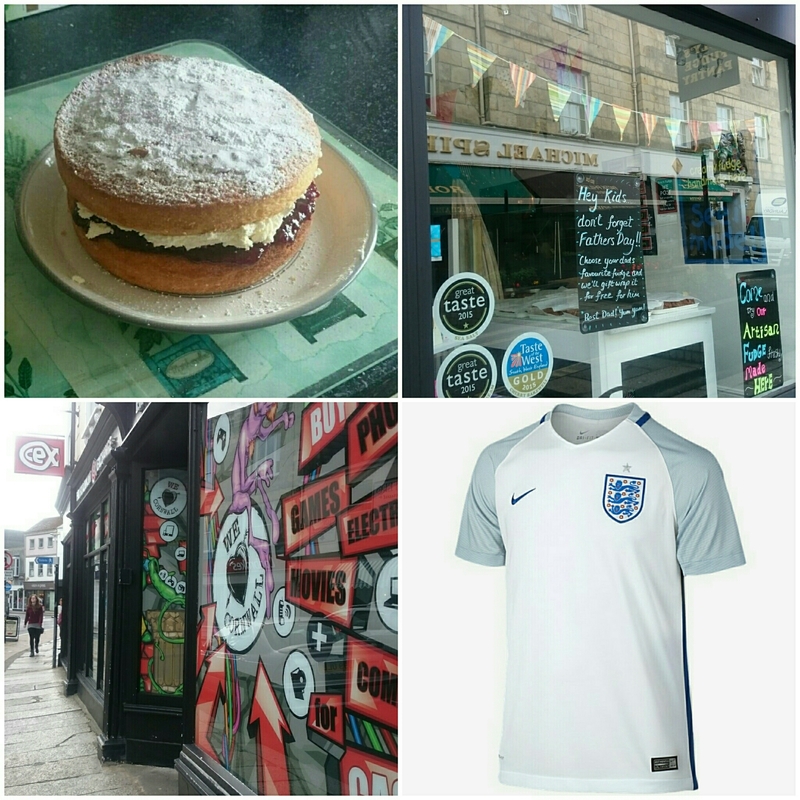 I Love Boston Tea Party, they offer a varied vegetaian menu and gluten free making it a very accessible choice for most social occasions. I ordered the most photogenic Mocha and Eggs Benedict, and I am currently having massive food envy. Bloggers Brunch in @btpcafes this morning, Eggs Benedict and a Mocha 😍 and of course, the best company and conversation! There was barely a quiet moment at our table, with giggles and everyone exchanging tips and stories. We all popped along the Barbican for an improptu photoshoot, where Alice and Nicole played photographers, and after a couple goodbyes we visited the Flavour Fest in the city centre. Normally the festival falls in August, and they were so lucky with the weather this weekend. There is nothing better than buying Macrons and Brownies whilst sipping fresh flavoured cocnut water. I decided on my gorgeous new floaty floral Primark dress, I picked this up a week or so ago and have been itching to wear it (the exposed shoulders make it inappropriate attire for my office). It’s the sort of dress that needs a slip underneath, as it is one thin but beautiful layer of chiffon, but its also the sort of dress that instantly makes you feel fabulous. I wore this with my tan cut out heeled boots (also Primark, a couple years ago) and walking along the barbican I felt like I should be in Italy, its such a cute and flirty dress. It was a very tight fit, that would probably look more flattering with some shaper wear but Im all about comfort and low maintaince fashion, and this weekend was too hot to even consider wearing tights. If white isn’t your thing (White and Navy are my hero colours) they have this is a pink base with a similar pattern, and at £13 its an incredibly affordable item that should last you many seasons. The most dating aspect of this item is the cold shoulder detail. I think my favourite part of this dress is the neckline, it shows off enough to look a little flirty and has the most beautiful ruffle which moves with you or the breeze. I bloody love that ruffle. I can see myself wearing this to summer BBQ’s and upcoming weekend lunch dates. I would like to thank the lovely Nicole for not only taking everyones photos, but for sharing such a beautiful shoot location. Do you like this dress? How would you style it?